This takes the "selfie" to a whole new extreme. 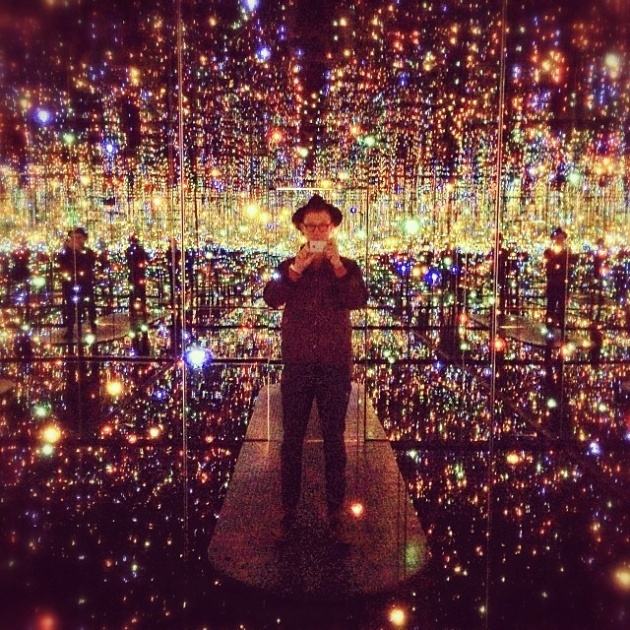 Artist Yayoi Kusama has unleashed a mirror infinity room in an art display here in New York city. There are hanging mirrors and LED lights surrounding the person in the room creating visual effects you're not going to get anywhere else. This doesn't necessarily mean you're just standing in one room with a ton of mirrors. You can simulate an infinity effect by standing in front of and behind just two. Another fun fact is you could do the same thing with overlapping imagery (such as a TV displaying another TV within itself). What's unique about this room is the LED lights. It simulates the effect (of course not actually as you'd be dead) of floating around a nebula or galaxy. See more photos of the Mirror Infinity Room here. Japanese artist Yayoi Kusama’s incredible ”Infinity Mirrored Room – The Souls of Millions of Light Years Away” installation at the David Zwirner gallery in New York creates the appearance of endless, near-boundless space. She achieves this effect by creating cubic rooms in which every surface, except the viewer and a small standing platform, is mirrored. Inside the room, hundreds of hanging, flashing, multi-colored LED lights make the observer feel as though they might be standing in a galaxy or a cloud of star dust. Although she has created similar rooms at exhibitions elsewhere, this one was created uniquely for this gallery, which will be on display up until December 21st, 2013.